Shop for Elephant Topiary. 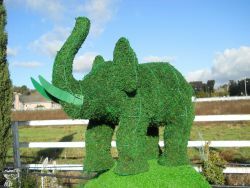 Bring a bit of Africa to your garden with this beautiful elephant topiary. Bring the majestic beauty of wild Africa home with this magnificent Elephant Topiary. Our powder coated wire frame topiary sculptures set the standard in design and attention to detail. Each piece is available as a frame, mossed, or lit. For sculptural simplicity, choose the Elephant Topiary Frame. This is the uncovered black metal form that is perfect as a focal point in your home or as a unique gift basket. 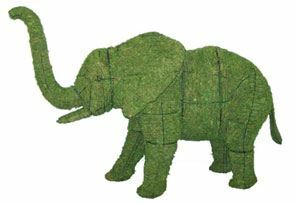 The Elephant Topiary Frame Mossed is the choice for indoor or outdoor planting. The frame is filled with pre-dyed sphagnum moss and is ready to support a cover of ivy or other foliage. 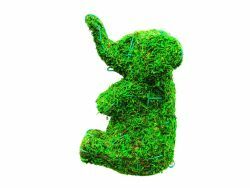 Our most dramatic Elephant Topiaries for sale are the Lit Topiary Forms. These are the metal frames wrapped in clear mini lights. 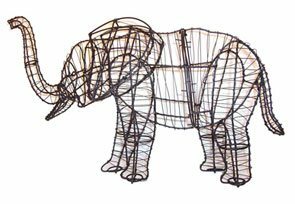 A smaller sparking elephant would be charming as an accent for your indoor holiday gathering, and our 60-inch model would blaze a trumpeting welcome to outdoor guests! All of our topiary forms are crafted by hand, which gives us the freedom to offer custom sizes and shapes. Please contact us to discuss unique size and design options that you do not find among our stock offerings. If you prefer to order from our stock selection, please keep in mind that the dimensions listed are approximate and slight variations in design may occur. Hand crafting guarantees that every topiary form is “One Of A Kind!” All frames are manufactured in sections, which helps to keep shipping costs down and allows for alternative planting options. O the creativity that humanity has been endowed with! O when it’s used for beauty and wonder! Some artwork is formed by employing the remnants of living things, items ranging from shells to hide or bones or sometimes more of the whole by taxidermy (as far as from fauna is concerned) as well as items of fallen leaves, wood, seeds, and so on (as far as from flora is concerned). But then there's horticultural topiary! Why have a topiary? An advocate for sculpting trees and shrubs into impressive and copacetic imagery may easily respond to this enquiry with, “Why not have a topiary?” However, we'll explore some reasons for the affirmative. We've already above touched on that topiary is without the morbid nature of the type of art forms that utilize the remains of animals and perhaps even that of humans. This isn't necessarily a judgment call on such, but the intent is to make a contrast to emphasize the fantastic reality that living trees and plants can be used to create topiary's art! So, indeed, just like in the case of more mundane horticulture, your topiary can be watered and otherwise cared for. Moreover, the caretaker has a direct impact on how aesthetic the topiary remains or gets and thus can experience satisfaction by the same achievements. Obviously the opposite is true, but the risk and potential loss comes with the blessing, similar to that of having an animal pet or, for that matter, giving birth to a child. Nonetheless, there's the artificial topiary moss alternative, too. Additionally, apart from the homeowner or business owner being able to muse on and delight in a topiary, so can guests and passersby! There's also the option to purchase a topiary instead of making one. Furthermore, there’s the option of buying and assembling topiary frames as well as stuffing it yourself with foliage or topiary moss or the other option of purchasing the whole thing already done. A topiary's maintenance? It’s really not any more complicated than general gardening, and, as in that case, whether or not your topiary is potted or in the ground will help determine what sort of nurturing measures it’ll require. Noticed that? Potted or planted! So there are those options, too -- the easy portableness of the former and the possible permanency of the latter. Now unto your opportunity to have your very own….pet elephant! Topiary elephant, of course! You could have a single elephant topiary or Dad, Mom, and, in tow, Baby! Or add another wild animal topiary? And wouldn't it be a sight were, say, a real white egret to alight on one of the trunked pachyderms?